A cartoon exhibition by Kate Charlesworth and David Shenton Throughout February 2010 The Drill Hall is hosting a major retrospective on the work of cartoonists Kate Charlesworth and David Shenton. Drawn Out & Painted Pink documents LGBT history from the 1970s to the present day. 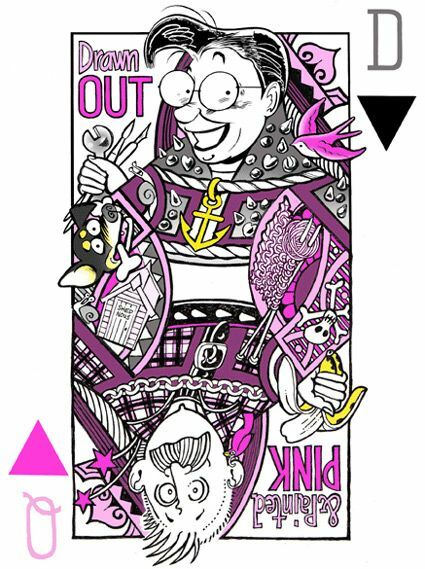 Kate and David have led overlapping cartooning lives during which they have, by default, documented a cultural history through 1970s' gay life, pretty police, HIV/AIDS, Section 28 and Dale Winton to civil-partnered LGBT lives of the new millennium. The exhibition will follow this 'pink timeline' leading visitors around the venue and ending in Drill Hall 2 where a series of events are planned to accompany the work. Kate and David live and work independently - and sometimes collectively - in London and Edinburgh. As queer publishing boomed, documenting the action, debating the issues and telling us where to go for all the fun, their work appeared in both the pink and plain presses, including The Guardian, Gay News, The Pink Paper, Sappho and Good Housekeeping. The exhibition coincides with LGBT History Month 2010. Like the best foreign correspondents (only funnier) their cartoons and comic strips have painted a devastatingly accurate self-portrait of LGBT life in the UK. Some of us suspect that they sneak into our houses and lurk behind doors with drawing-pads at the ready. They've even managed to eavesdrop on our dreams. They've got us bang to rights in the ways we were, the ways we are and the ways we could be. These are social documents of the highest order."